The Simpsons Fast Food Blvd, a single dining venue featuring several Simpsons-themed “restaurants” including Krusty Burger, Cletus’ Chicken Shack, and Moe’s Tavern. 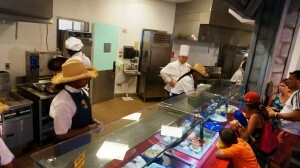 Quick-service counter serving chicken. It’s worth noting that the Cletus’ Chicken Shack facade you see from the exterior of the building is just that, a facade. Through the door is the line up of Fast Food Blvd counters. If you have a hankerin’ for some fried chicken, Cletus’ Chicken Shack is the place for you and your kinfolk to settle down for some great tasting vittles. With the trademark Simpsons brand of humor throughout the menu, the corn flake based batter will have you licking your fingers. 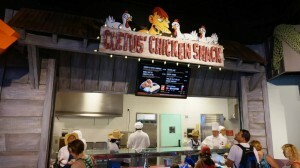 Cletus’ Chicken Shack at The Simpsons Fast Food Blvd. Entrees are $8.49 to $10.99. When ordering the Chicken & Waffle sandwich you will be asked if you’d like the maple syrup mayo on the sandwich or on the side. Our recommendation? Get both, it’s that good! Cletus’ Chicken Shack was originally going to be the Kentucky Fried Panda restaurant, but Universal changed the concept to avoid potentially offending any guests. Cletus’ Chicken Shack and Lisa’s Teahouse of Horror are the only two brands at Fast Food Blvd that have not made an appearance on The Simpsons TV series. 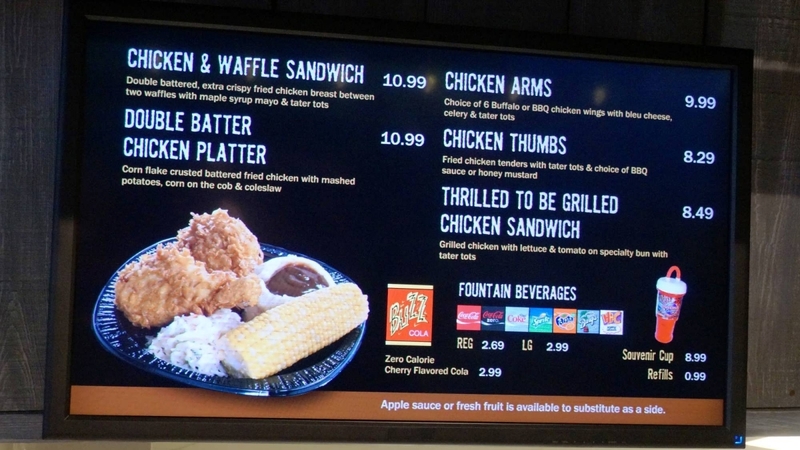 All the food counters at Fast Food Blvd serve the standard selection of soda drinks and The Simpsons exclusive Buzz Cola (a zero calorie cherry soda product), and they participate in Universal’s souvenir cup refill program. 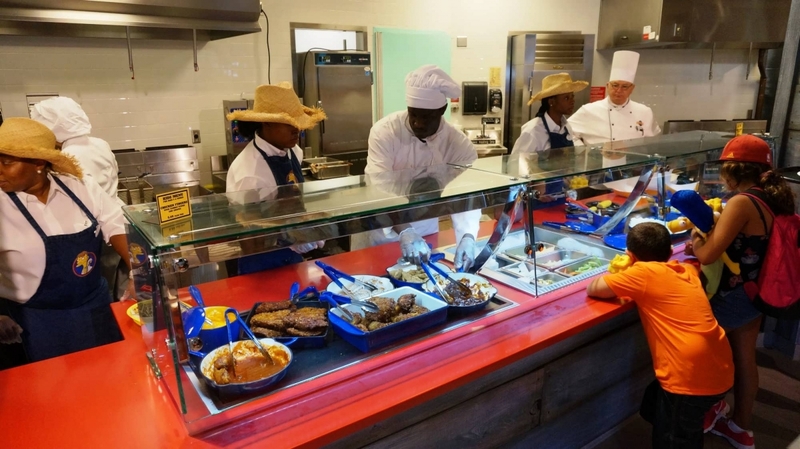 Likewise, Universal Dining Plan credits can be used here. However, please note that there are no Coke Freestyle stations in the building. I had another chicken and waffles sandwich washed down by another Duff Lite the last time I was there and I still loved it. Sorry Louvennia, but my review was real! Nobody in my family is a chef though! I recently visited Universal Studios Orlando for my boyfriends birthday. We both love the Simpsons so we decided to eat in Springfield. I took one glance at the menu and saw a chicken and waffles sandwich and knew that's what I wanted. My boyfriend, who is a chef, also ordered the same thing. We took one bite and regretted our decision immediately. The waffles taste worse than the frozen waffles at the grocery store! The chicken was not seasoned at all and the syrup and mayo combo is absolutely disgusting!!!!! Why would you combine the two?? It should only be real maple syrup, I don't believe that was maple at all, and no one I know eats mayo with their chicken at waffles. Maybe you guys should just scrap the whole sandwich! Just have the chicken and waffles be seperate like it normally is because the picture was definitely deceiving! I'm extremely disappointed and so was my boyfriend. The food is too expensive for it not to be cooked properly. I don't even believe the other reviews are real! Either they are made up or they just did a poor job on the day I went. Yuck!! Praise the maple syrup mayo! 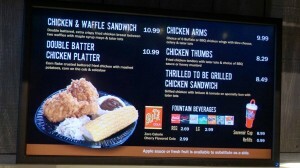 The two things I was looking forward to most about the new Simpson's food court was trying a Duff Lite with chicken and waffles. I was not disappointed. The only thing that bummed me out even a little was that the waffles seemed to have been frozen rather than fresh. I had read the few reviews already posted before trying it so I took everyone's advice and got the mayo on the sandwich and on the side. What a great idea! It was really, very good, and I admit that I went into it with a little skepticism. I mean, maple syrup mixed with mayo? 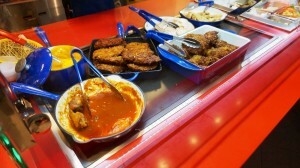 Turns out it is the best sauce I have tried at Universal and it was great on the sandwich and on the tater tots. Yes, tater tots, at a theme park! My husband thought it was so neat to see tater tots he ordered just a side of those. I managed to get a sandwich that wasn't premade due to large crowds and it was great. Hot, crispy chicken, cold tomato and lettuce, and of course the warm waffles. Of course fresh waffles would have been better, but I still enjoyed it very much and look forward to when I can get another one. Washing it wall down with a Duff beer while it poured down rain outside was a great way to spend an hour at Universal! Being from the UK a mixture of sweet batter waffles and Chicken is not a combination we ever eat, therefore on my first visit to the fast food boulevard and saw the mix of maple syrup, waffles and chicken... I had to try it! I had a chicken and waffle sandwich from Cletus' chicken shack and let me tell you...HOLY DECICIOUS COMBINATION!!! I ended up having 3 of these tasty sandwiches during my 5 day stay. First let me say this-Order some of the maple syrup mayo on the side, you will not be disappointed. I like to eat things separately so first I had one of the waffles slathered with the maple syrup mayo. The waffle had a bit of the tasty chicken coating on it and it was perfectly crispy and delicious. Next I cut up the chicken and dipped each bite into the maple, mayo goodness. I felt just like "drooling Homer" looks...YUMmmmmmm! Next I dipped each of the tasty tater tots into the maple syrup mayo. It was a tasty, crispy delicious experience and the tater tots took me right back to my childhood. I finished off this tasty meal with a refreshing Buzz cola. 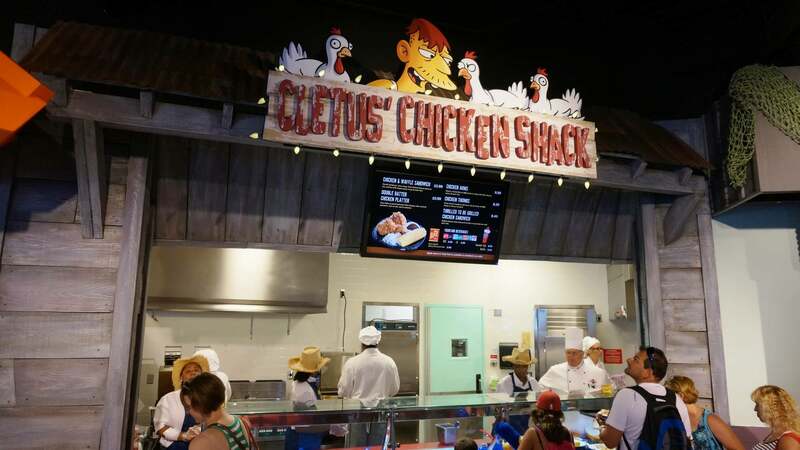 I will surely be visiting Cletus' on my next trip to Universal.